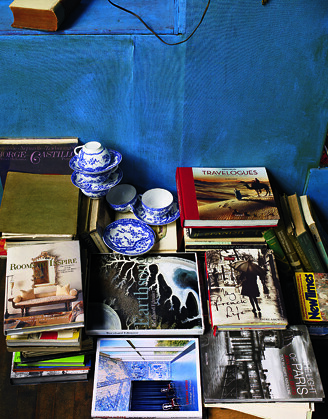 You've probably encountered the work of photographer Roland Bello in your own home—that is, in the form of Anthropologie's moody, "global rambler" catalogs. Born in Cuba—a place he's still dying to shoot himself—and raised in Miami, Bello left his post as creative director for Real Simple magazine after a photographer literally handed him a camera and told him to snap the shot. "And then I knew I was hooked," says Bello. "No turning back." Since then, Bello has worked on a wide range of projects including fashion, food and commercial photography, but interiors have always had a special appeal, which he articulates as the allure of "creating a story out of a space and a few inanimate objects." In particular rooms featuring mid-century modern design elements—"more 70's than 60's or 50's, I think because I was a kid at that time and it brings back good memories"—continue to captivate him. "[I like] the idea that something happened in that space right before I took the picture." Aside from saturated colors and impeccably styled spaces, a hallmark of Bello's photography is the feeling that a person—a very stylish person—has abruptly left the room you're looking at, and left things only slightly askew. As for his enormous body of work at Anthropologie, Bello says simply that it "was a fun time. It was back when I first started shooting professionally. They basically allowed me to do what I did and so a lot of that work, I feel, was me pouring out a lot of years of pent up frustration as a frustrated photographer. So in a way the work and style was kind of personal, albeit on a commercial level. I'm doing some work with Anthropologie again after a few years, and it's funny how familiar and comfortable it feels."